I'm an alpinist wannabe, but first of all I'm a computer science student at Ca' Foscari University of Venice and ICT System Specialist at InfoCamere SCpA. It's quite so long i'm on the Internet and i'm a Linux user since 2003, so i can say i'm pretty experienced on both. 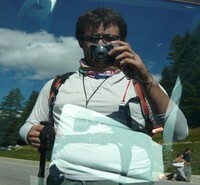 I love mountains, in particular Dolomites, principally the ones in Val di Zoldo and Pale di San Martino. I like hiking and climbing, even if i'm not very experienced in. I do not really know what i want to do in my future, but for sure i'll do something new that i haven't done in my past. Maybe.